inflatable SUPs can be made super durable...way back in the day ULIboards made a bunch of test boards for the coronado guys using their special material that they use for their inflatable boats...it turned out to be too heavy to be competitive asa surfboard but it was able to stop a 9mm fired from a glock...and most importantly they looked really COOL! The material can be crazy tough. Most failures are from glue (seams) or valves rather than punctures and usually don't happen on the water. More likely in the sun building up too much pressure when seams give way and valve trouble usually happens when removing the hose after getting to pressure and it doesn't seal or when you have trouble getting it to stay open to deflate. On water troubles are extremely rare. I am still only using a hard board offshore. They are tough against blunt impacts. But they can cut fairly easily if they encounter something sharp in a slicing motion, especially when inflated. So stay away from rusty buoys, sharp seashells, barnacles etc. It seems to make sense that would be true, but it doesn't seem to happen. On a lot of other forums (FB groups, actually), the majority of people have iSUPs. They get paddled onto oyster bars, dragged over rocks and hit rusty I beams all the time. There is a video of this one guy taking his down a culvert and his board is a little wider than the stream of water and the "rails" rub all the way down. I have never seen a first hand account of a slice or puncture on the water or a second/third hand account where the person could point to a report/post of the incident. Like I said earlier, I still don't trust one on the open ocean. But lots of people do and there are very few verifiable horror stories. I still see it as one more thing that could go wrong, but the odds of it seem to be extremely low. Even the dirt cheap ones have a pretty good track record for durability. The cheap ones tend not to be as rigid and have little innovation/variation in shapes; oblong all arounds with a kicker up front. 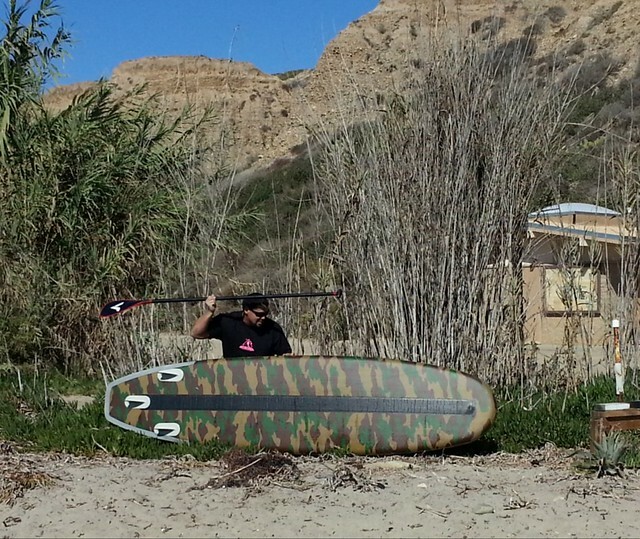 I own one of the cheapies; it got me into paddling SUPs and I might not have tried paddling a SUP if the price of admission was steeper. Once I knew I liked it, I ponied up for my second board (hard board) and will again for at least one more, which will be a hard board because I want it to perform well in the surf. I'd still recommend a board - but I would not be surprised if it just got them into sup and then they got a hard board later (like me). at 5:15 ...it is weird.....it really must have been something razor sharp. I've abused my boards quite a bit. No leaks. Thanks very much for posting that vid - I’ve been looking for it for quite a while. Watching it when it first came out had a profound effect on my use of iSUPs. I would say that after DJs two videos and blogs, which are the most important SUP safety warnings out there IMO, this video is the next most important. Anyone who uses an iSUP should be made to watch this. Well, I have to change my earlier statement as I now have seen footage of an iSUP puncturing on the water. I bookmarked it for discussions on other boards (FB groups). He does have a Fanatic. They have their iSUPs in single and double layer construction, the former provides you with a lighter board and leaves you with a heavier wallet. The double layer is their Premium construction. It would be interesting to know for sure which he has, but the cheap ones like my starter iSUP are almost certainly single wall; mine is lighter than high end boards of the same size and shape. Anyway, I am definitely glad I followed my gut and got the hard board for open water touring despite assurances from touring iSUP owners. Everything always seems absolutely fine, until it absolutely is not. Yup - for instance, I thought a lot about it after reading about Bart's Greenland trip alone. No issues mentioned with the board at all by Bart - but, like Area 10, I think about the "what if's" a lot. I've been dreaming about paddling the full length of the Yukon - I think an isup actually makes sense for this but - what if? I think either a raft or spare board should be brought along - maybe self-inflating raft? if you could get out of the water and get yourself situated - you could repair the isup and re-inflate even. Pack-raft? Expensive but light. !! Googled -huh - not all options are that expensive for a rescue platform...not sure you could inflate it while floating in your life vest. 35oz, 4"x9"!! If you could instantly inflate that thing - pretty good rescue raft. Isups are pretty reliable but you need a backup for "what if". I still like my isups regardless I have 3 but I don't go miles from shore. No leaks so far! You would also want a K-PUMP or something similar. Not a lot of places to stand up and pump your board in open water. That shape would pack better also. They sell gauges separately. You can see in one of the photos he has a small-diameter "standard" sup pump - the advantage over the k-pump is you can connect the hose then hold the pump in both hands - the small diameter will allow high pressure with lower effort - but it will take awhile to fill up a sup. I'd guess 500 pumps (yes, I've counted with the different pumps I have ) compared to a 250-300 of a typical pump. I can't find what raft he used, but I suspect it might be similar to this one I found last night - one version can be worn as a sort of fanny pack - the "loose stuff" version is a 7"x12" stuff-sack you can tie to the deck of the board pretty easily. I believe the guy with the cut board could have self-rescued with this(still better to have others to help ). I would say even with a hard board this raft or similar would be a good idea for a really extended open ocean run. I also imagine it costs as much as the average isup. No small investment. I seem to have led this thread astray a a bit As far as longevity goes, even the board that got a cut could be still in use somewhere. I'll add Bart's Greenland Packing List to the "long distance adventure" thread. I can just about guarantee you the cut board is still in service. That's the first time I have seen evidence of one damaged on the water, but there are plenty of stories of damage on land that aren't life ending for the iSUP. Mine has one small patch. It got run over while deflating by an idiot's boat trailer. It broke an "ear" off the plastic valve cap, which was unscrewed and lying on the board. The sharp point of the broken plastic just barely pierced the skin and it had a pin hole leak that I didn't notice until the next time I was going to use it. So it has a dime sized patch. On the ground deflated is their kryptonite. It is probably the time they are in the most danger of being damaged; there is no "give". Dropping something on it that would bounce if the iSUP was inflated can damage it on the ground. They can catch on things if dragged that they would slide over if inflated. I have seen other iSUPs with bigger patches. Some have reglued seams. The little raft is pretty cool. I would think if you used one on a hard board trip it should be the belt one. 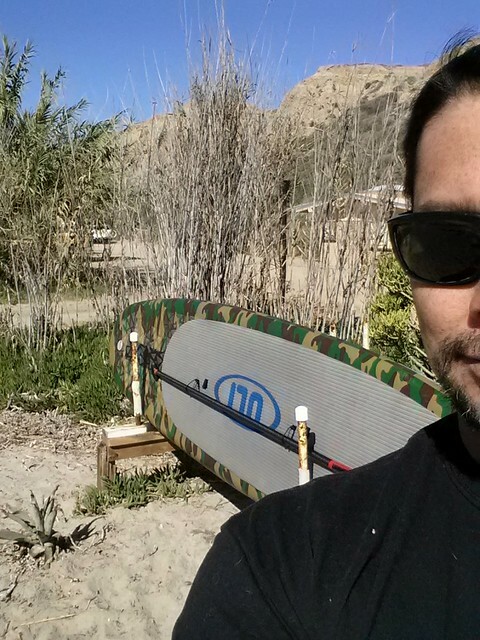 If I need a rescue raft, it means I have lost my board. Even broken into a few pieces, there would probably still be a big enough piece to float on. It would probably function as a sanity check - if I have to belt on a raft as a safety precaution, is this really a paddle I should be considering? I love dreaming/reading about crossings and whatnot, but they really belong on the "stuff I should have done before I turned 60" list. Owned a ULI which we kept at Caribbean home for relaxing days on flat water. Kept it rolled up in storage and used every 3-4 months a few days at a time. After about 4 years, my wife and I were paddling the Uli and my Coreban down to a beach bar. We beached the boards and grabbed lunch. About 1 hr later when We returned to the boards, the Uli had turned into a floating sausage. The air chambers inside had rotted/separated and the board was now one big inflated hot dog. Tried to sit on it and paddle back which was hilarious and difficult, so I ended up getting a tow. Gave the board to local kids to use as a float. It was 4 years old, but I always rinsed the board and was careful putting it away each season. I am sure the ULI sitting on the beach in the hot Caribbean sun for an hour didn’t help, but I never would have imagined it would implode. ULIs always seemed indestructible on the exterior. I don't think I've heard much discussion with regards to the actual drop stitch fabric itself failing and why. It's usually the seams or valve that fail. My ULI lasted years, but I almost always had it inflated. I think your ULI my have had some moisture in it, which caused the drop stitches to mold or rot, and that cause the drop stitching to fail. (The drop stitches keep the top and bottom of the board an even 3.5" or 4" or 6" part depending on which spacing stitch you buy.) Being left in the heat probably was the last straw / or stitch The seams held and it stayed a float, so that was good...I guess. I wonder if filling it with a compressor puts more moist air in the inflatables than is good for them. The standard hand pumps would put less moisture in the board and might be better for longevity? Yes I was debating whether to leave inflated or deflated. I think the first year we would leave it fully inflated, but then needing more space we deflated and rolled up. I only used a hand/kite pump never a compressor. That being said the humid , salty , sunny atmosphere all must have taken a toll on the boards interior. The exterior was still bullet proof. Tall Due I think you are spot on about the stitches failing rotting possibly due to moisture. I thought about attaching hand straps and using is as one of these banana floats they tow behind boats.